It’s not often I find myself dining where I don’t have to ask a gazillion questions about the menu. “Is there gluten in this? Are you sure? There’s no soy sauce in the marinade, right? How about the salad dressing? Can I please read the label? Would the chef please confirm for me?” It was an absolute treat to visit Annie May’s Sweet Cafe for this exact reason. And also for the amazing food. I visited Annie May’s a few times while working in Louisville. One day I had an oatmeal cream pie and a classic cupcake. 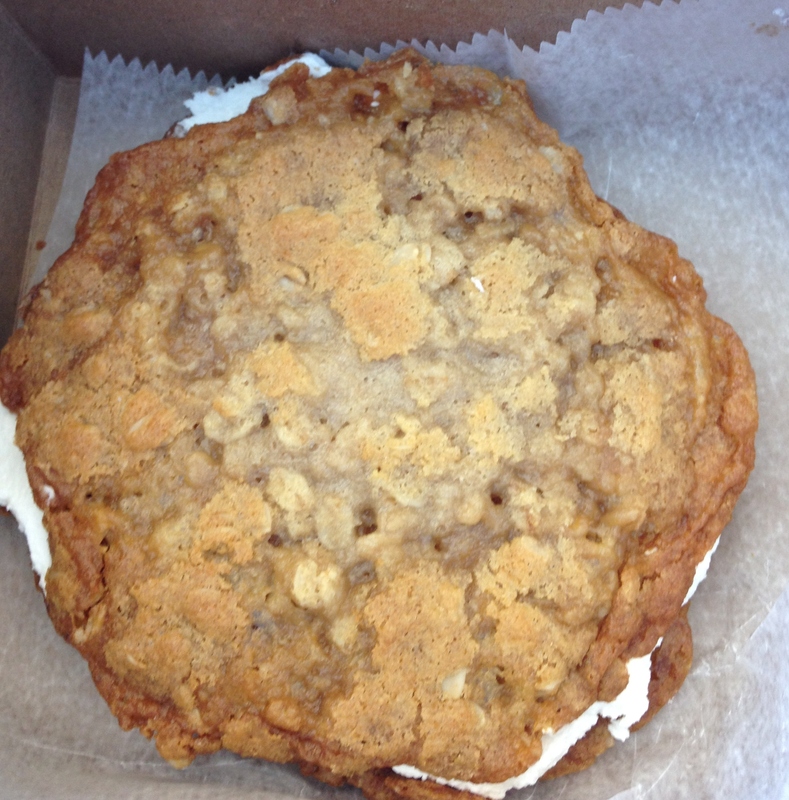 The oatmeal cream pie was much larger than the Little Debbie version and also much more flavorful. If I could figure out how to make the filling, I would eat gallons of it. It’s better that I don’t know. The oatmeal cookie part had a nice crunch around the edges and was chewy in the middle, my idea of a great cookie. The Classic cupcake, Annie May’s take on a Hostess cupcake, was a light and moist cake with a fluffy filling and a ganache on top. 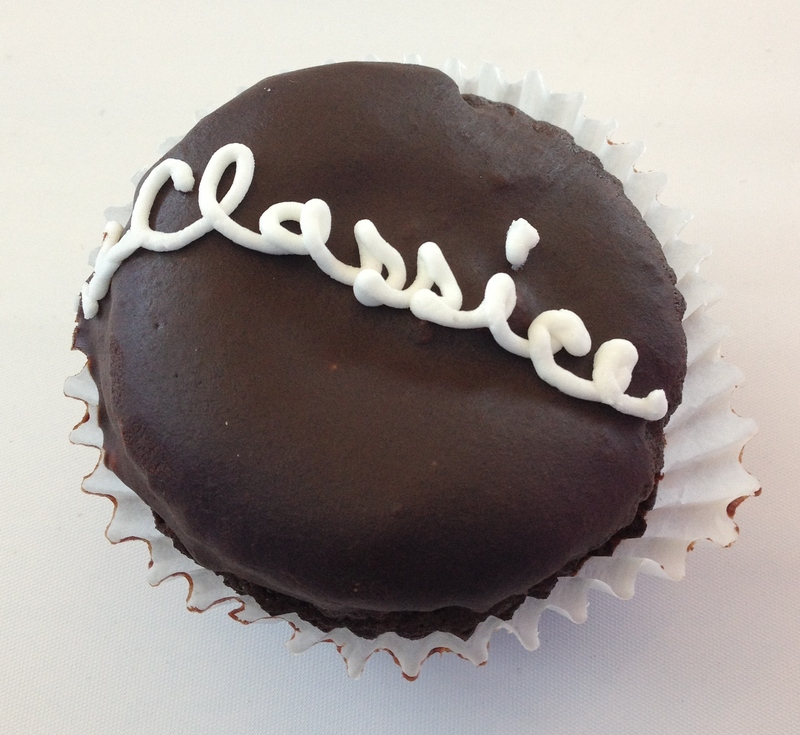 I think it is clever that they piped the word “classic” into the swirls of frosting. This was one of the best gluten-free cupcakes I have had. On another visit, I had a funnel cake. While writing the 52 Foods on a Stick blog, I watched my friends eat a lot of fair food. Most of it I’m okay with not being able to eat, but I do really miss an occasional funnel cake. Sure, I could make one at home, but having one out is part of the experience. 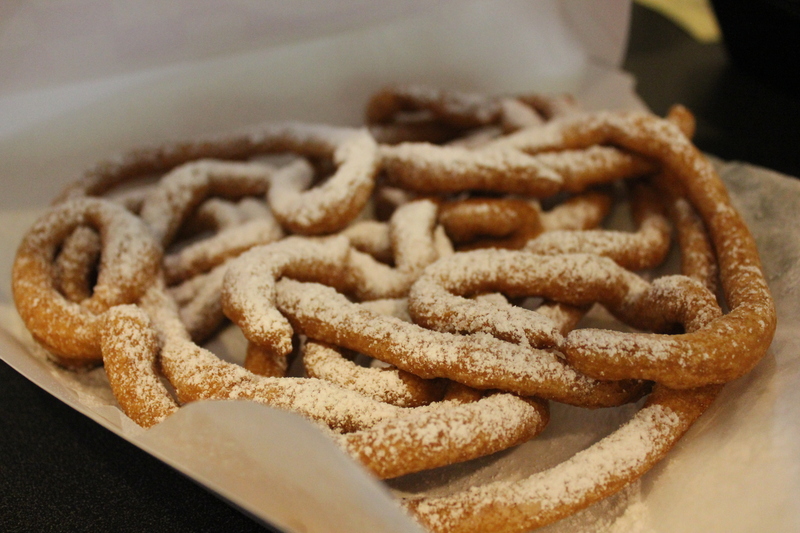 While it’s not exactly a fair food experience, this funnel cake was perfect in every way. In some ways, it was better than fair food, grease had not completely saturated the plate it was served on and I didn’t have to wait in a line outdoors on hot concrete. Fluffy, soft cake on the inside, slightly crispy on the outside, it was a perfect funnel cake. Toppings were available but I ordered mine in fair-food-purist fashion, powdered sugar only. My final visit was for lunch. 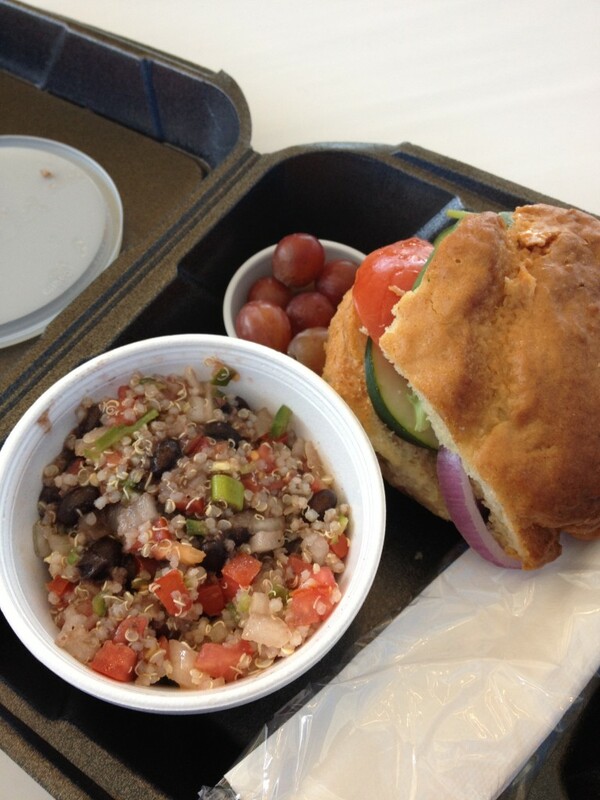 I got a box lunch to go, a sandwich, quinoa tabouli and fresh fruit. I got to customize my sandwich with a wide selection of vegetables and vegan cheese. The quinoa salad was a nice, light salad with a vinegar dressing. The bun, made in-house at Annie May’s, was a nice sandwich size and didn’t fall apart as so many gluten-free breads do. The next time I’m in Louisville, I’ll definitely go back to Annie May’s. I may find a reason to visit Louisville just to go back to Annie May’s. I’d very much like to try their pizza and the other bakery items I didn’t manage to eat my way through. I highly recommend you stop by to visit, too! 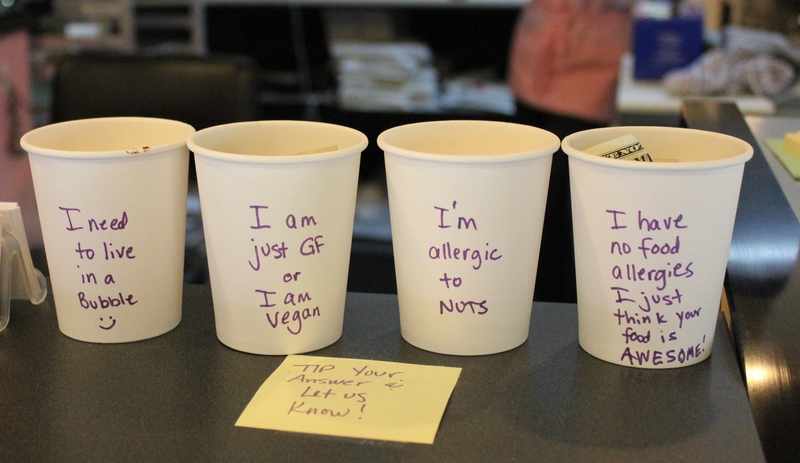 I got a good laugh out of their tip cups. Which one would you choose? EAT WITH: wild abandon! They get gluten-free here and will take great care of you. Tell them what you can and can’t eat and they’ll point you the right direction. 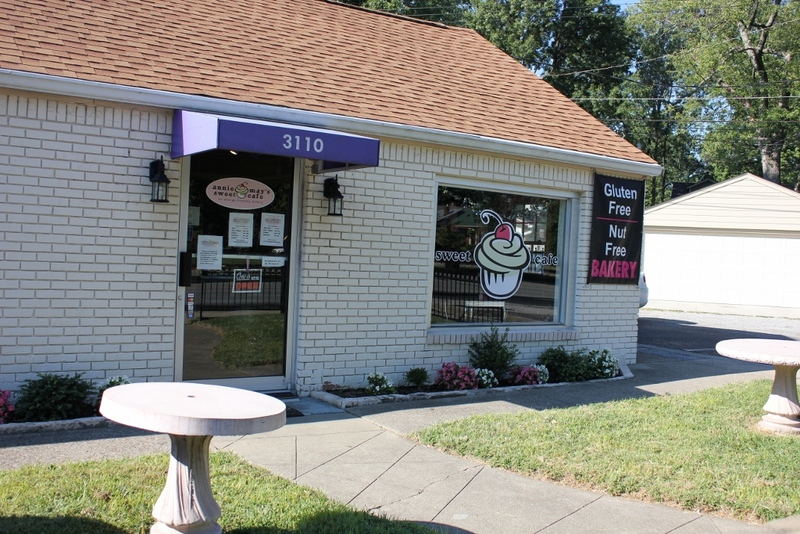 Annie May’s Sweet Cafe is located at 3110 Frankfort Avenue in Louisville, Kentucky. 502.384.2667. Johnna’s I Ate Here series is not intended as a restaurant review, rather a summary of Johnna’s experience dining out. You may or may not have a similar experience. 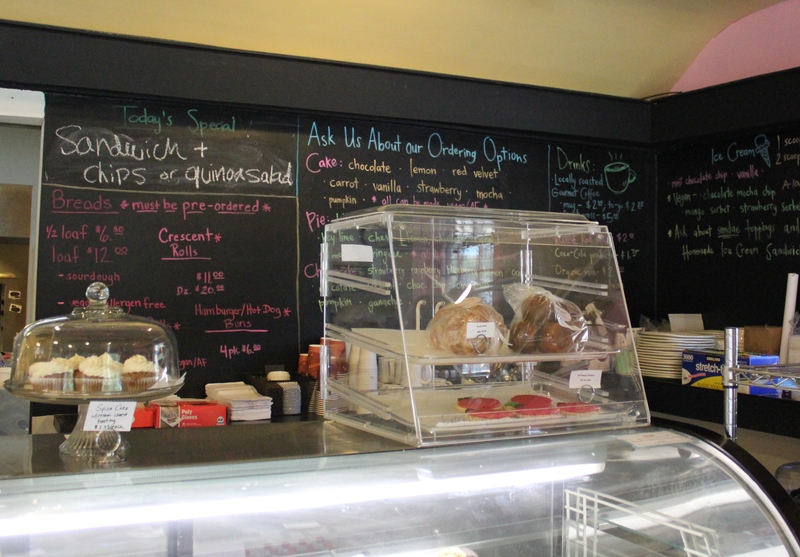 Menu prices, items and ingredients featured were current at the time of writing. 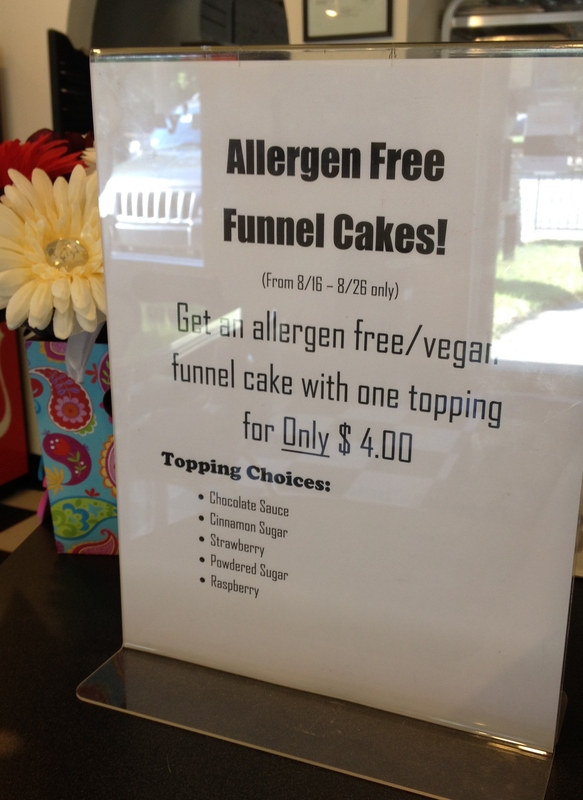 Please read the menu carefully and ask your server for assistance in ordering if you have dietary restrictions. It’s never a bad idea to call ahead and let the restaurant know of your food needs. The past several summers I’ve had extended work stays in Louisville and made many visits to Annie May’s. Always enjoyable! Can’t wait to read your post!